For this week’s Photo of the Week, I decided to post the picture that got the most likes on my new Instagram feed. Taken in San Miguel de Allende, it is a picture I shot a couple of years ago, but the view hasn’t changed a bit. It could have been taken yesterday. Or a hundred years ago if they’d had really good color film back then. It shows the roof line of the Colegio de San Francisco de Sales, located on the Plaza Cívica, next to the church of Nuestra Señora de la Salud. The building and the pleasant plaza in front of it are about three minutes’ walk from the Jardín, San Miguel’s main square. Since we Nomad Women tend to have a few years on us and therefore understand the importance of history, we often like to know a bit about the past of what we’re seeing. We like to know the stories behind the buildings. So…. The Colegio de Sales was built in the early 18th century by the priests of the order of San Felipe Neri, who also built the church next door. 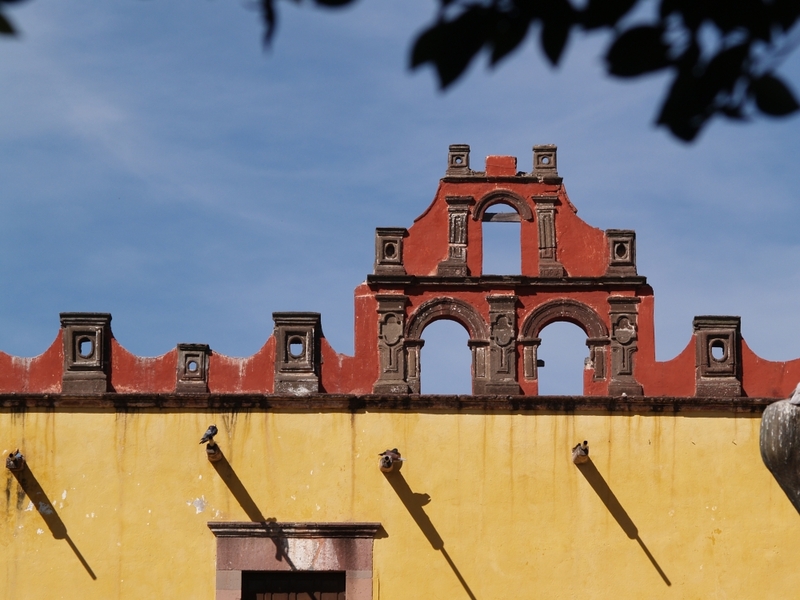 This area of San Miguel de Allende was the heart of the town almost 200 years ago. The main market was here, the main churches were all here, and the college topped it off. This was the principal crossroads for business, religion, leisure and commerce in this important and wealthy colonial city. The Colegio de San Francisco de Sales catered to the criollos, sons of the rich Spaniards, as well as to deserving poor students. The price of enrollment was on a sliding scale and cost between 12 and 300 pesos a year–at a time when a common laborer earned about one peso a day. The courses of study included Theology, Rhetoric, Grammar and Philosophy. San Miguel’s namesake, Ignacio Allende, studied here, as did another Hero of Independence, Juan Aldama. I like to imagine them running across the central patio on the way to a Latin class, maybe cutting up a bit and earning a frown from one of the priest-tutors. Or perhaps racing out to the nearby market for a pan dulce between classes. Did they have any idea that not so many years later they would change the entire course of Mexican history? And that they would pay for that change with their very lives? Today, the building is little changed from their time. In fact, it once again serves as a center of education. Today it houses a branch campus of the University of León. Gray Skies & Ferris Wheel-Dam Square in Amsterdam The Best Thing I Ate in Las Vegas – Frozen Custard!